Colonel A.I. Kitov. In 1959 he proposed the government of the Soviet Union (personally to N.S. Khrushchev - then the General Secretary of the USSR Communist Party Central Committee) a very progressive project entitled "Red Book", which dealt with the management system rebuilding in -simultaneously- both the USSR national economy and Armed Forces based on creation of the common all-state network of computer centres. Unfortunately then the project was rejected by the higher Army`s authorities and Kitov himself subsequently suffered numerous unjust oppressions from the state officials. Anatoliy Ivanovich Kitov has been one of the brightest personalities in the Soviet computing and cybernetics. He might be rightfully mentioned among the topmost dozen of our scientific leaders famous with their decisive contribution to establishing and development of the computer science and industry. Anatoliy Kitov was the pioneer of the Soviet cybernetics, one of those who - one could say - `lit the way` for electronic computers extensive development and their broad-scale implementation. I (the author - Levin Vladimir Konstantinovich) have been working as a scientific expert on development of specialised computer systems - the field Anatoly Kitov was also concerned to, as he was a responsible specialist of the USSR Ministry of Defence on digital electronic equipment, but unfortunately we had no direct working contacts. However, we were personally well acquainted since the times of the first digital computers and were happy to share the same scientific, theoretical and applied, ideas. So, one could say that we were `virtual colleagues`. Kitov`s name became rather popular already during implementation of the first Soviet digital computers "Strela" and BESM. We met with him at scientific seminars, conferences and consultations on various aspects of computer theory and engineering. Those times they were numerous, although some of the presented subjects were surrounded with certain secrecy, in fact natural for the matters of defence. Communication with Kitov was always easy and the grounds for common interests were quickly found, what stimulated our instinctive tendency to mutual support in research and publishing. In reality he was a young man then, born in 1920, but already a mature person. Belonging to the "Generation of the War" Kitov, as a veteran, possessed rich personal experience and, with enthusiastic learning, he has also acquired profoundand extensiveprofessional knowledge. That `lucky combination`, complimented with impressive organisational and pedagogical talents and a "fountain of energy", quite logically put him into position of a leader and teacher among those young specialists - university graduates, who together with him started their careers in the -just emerging- computer science and engineering of the 1950 - 1955 s. In the following years his reputation of talented engineer and scientific expert with wide and solid erudition, as well as of able leader and teacher, was steadily growing. Some events and episodes could be mentioned here for the better illustrating his broad interests and multifarious activities. Thus, publication of his book "Electronic Computing Machines", in 1956, had been a very important event in scientific and especially in the university life. That was the first Soviet book on computers and computations. The next book, "Electronic Computers and Programming", he wrote jointly with N.A. Krinitskiy, also very able scientist. Content of that second book was more than 2 times bigger (and it was correspondingly thicker); it became de facto both the only available university course-book and simultaneously an encyclopaedia on the computing. This fundamental, well systematised course became invaluable source of computer knowledge for thousands of Soviet specialists, who formed the first generations of our engineers and programmers. No wonder that the book was most often mentioned by them not by its title but as "Kitov and Krinitskiy". As the both books provided not only theory but large practical material they were also popular among experienced specialists. Electronic computer "Vesna" (the spring) was the USSR first big semiconductor computer. The author headed its design and development, which started in 1959. The State Commission on computing machinery tested it earlier than the famous BESM-6 that was why "Vesna" remained in serial production for some time. I mention this computer here because scientific influence of Anatoly Kitov made big impact on both its design and application. The computer also attracted attention of other scientists, who worked at the same institute as Anatoly Kitov himself some years before. His traditions and personal influence were still strong as they were preserved by remaining there colleagues. The first one of industrially produced computers "Vesna" (extended model) was mounted at the computer centre of the Ministry of Defence. This, the first and one of the biggest computer centres of the country had been founded by Anatoly Kitov, who created there atmosphere of wide scientific interests, research innovativeness and daring answering to all possible challenges. During the 1960-1965 period I participated in projects on automated translation of texts. Then we were closely collaborating with G.G. Belonogov, who in his turn had become one of the initiators of that work, under Kitov`s guidance. Researches of such kind are related to solution of the so-called "difficultly formalised problems", which were also a subject of Kitov`s interest. Here the difficulties appeared everywhere: in indefinite (or weakly defined) setting of a problem, in searching of non-traditional solutions and working out criteria for their results evaluation, in human-computer dialogue realisation, in reasoning the needs in computation resources and necessary amount of labour. Debates on choice of scientific researches orientation and possibility of achieving desirable results were very intensive and sharp. Various related over- or under-estimations often led to personal confrontations, affected ambitions and, as a sequence, to organisational chaos. At present the progress in this -now greatly expanded- field is impressive, however the difficulties in understanding of basic problems as well as related percentage of personal conflicts largely remains the same. A big resonance among the scientific circles was caused by Kitov`s letter of the 1959 to the government administration. In this letter he proposed principally new information processing structure, which should be based on a network of physically connected computers distributed over the whole territory of the country (a glance at a map of the Soviet Union is enough to understand dimensions of his idea /ed./). This network of computing centres should serve double purpose. It was primarily to support information exchange and processing within administrative structure of the Ministry of Defence and simultaneously to perform various tasks in the field of civil economic development. In reality that was the first project (of such dimension) of what is a "self-evident thing" for our contemporary daily life. Now his design is named `Grid-technology`; it means, joining numerous computation centres with the aim of empowering solution of global problems. That time it was absolutely pioneer idea, since there was no even a couple of computers with really stable operating connection (no matter how simple). Such things existed only in theory then. The proposal on connection of already existing computer centres into a common network with double military-civil purpose aroused vivid interest within scientific circles. It was commented there, "Kitov`s report is circulating in Kremlin". Of course the idea was perfect and clear, it was also obvious that this project increased interest of the government administration to development of digital computing machinery and large-scale applications of electronic computers. However, making the principal decision obviously encountered numerous obstacles and was generally slow. As late as by 1970 a new term - `Joined State Network of Computing Centres` was coined, together with some pilot projects, but in reality their realisation was limited by some smaller information networks of some ministerial administrative structures. The project of the interactive computer centres network proposed by Anatoliy Kitov was an abstract global idea on one hand, but a concrete design on the other one, it could be also called "Direction vector". At present, numerous creative task-forces at the Russian Academy of Sciences, universities and industrial enterprises intensively develop new concepts of the Grid-technologies. The Academy Presidium established target program "Network Technologies". Influence of A.I. Kitov`s ideas is very essential in this aspect, as well as in general development of computing, in teaching and training of young specialists. His special merit is connected with the `confidence problem`; due to his efforts administrators and other potential computer users made notable psychological progress towards making computer their familiar, necessary and -eventually-routine tool. In later period A.I. Kitov demonstrated interest to development of the Unified Series of (compatible) Electronic Computers - the large-scale international joined work, in which I also was lucky to participate. General concepts of that program co-inside with the ideas of computer networks and his personal efforts on their promotion. Anatoliy Ivanovich Kitov was a brilliant scientist and a wonderful person. It`s always pleasant to see his students and followers, members of his family and his friends. There are also many examples in scientific literature, which display successful development of his ideas. Memory of Anatoliy Ivanovich Kitov will always remain both in our hearts and in the history of computer science and engineering. 1. 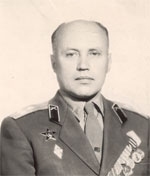 After the war Kitov studied (1945-1950) at very popular Moscow Artillery Engineering Academy (military), where he entered to the second year level. He passed all exams for the first year course together with the entering examinations. Scientific level of the academy is equal to university one. (Ed. note).